Anyway, I particularly love when healthy recipes don’t require obscure specialty ingredients. Don’t get me wrong – coconut flour and pitted dates have their merits. But most people just don’t keep them around all the time. 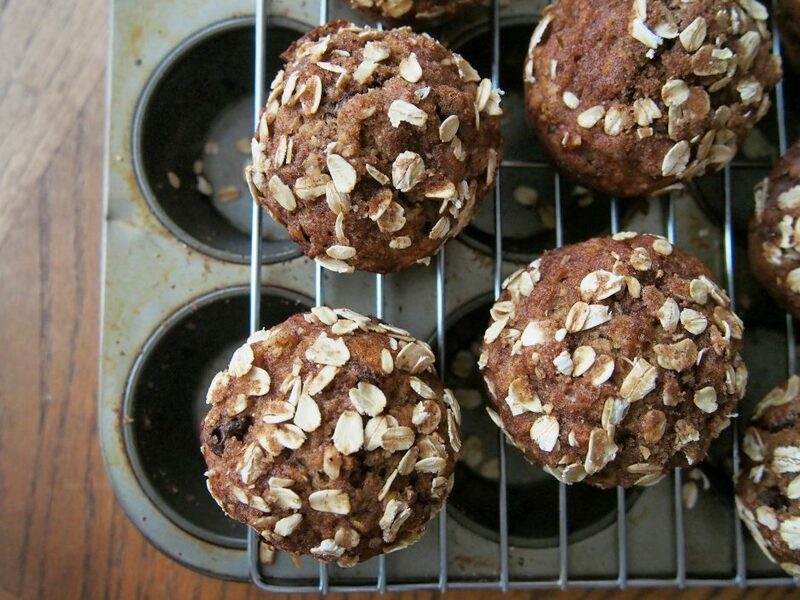 These muffins are made with whole wheat flour and oats, which keep you full for longer than your sugary cereal. Instead of oil or butter, the unsweetened applesauce and mashed bananas keep the inside moist, and the honey (or maple syrup, if you prefer) sweetens them a little more. You could easily leave out the chocolate chips or swap them for blueberries to save a few calories, but banana bread and chocolate chips are inseparable in my mind! And unlike flax eggs or rice milk, I almost always keep chocolate chips in my pantry. By the way, when we got back to the Union to watch La La Land for real – we overheard a group of confused people thinking they were about to watch Moonlight. Glad to know we weren’t the only people confused by the time switch! I can’t have an opinion on which film was more deserving of Best Picture because I haven’t actually watched Moonlight yet, but – what do y’all think? Should we have stayed and watched Moonlight instead of La La Land? 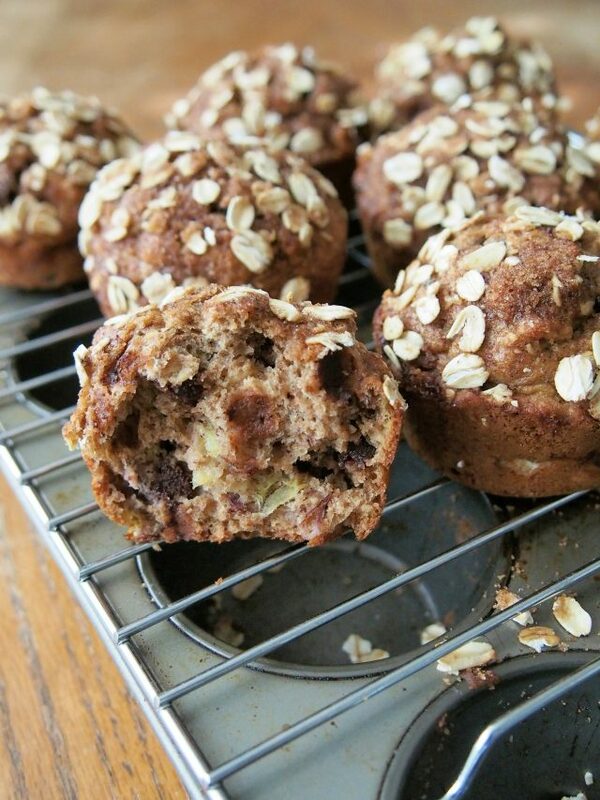 Use up your overripe bananas with these hearty, whole-wheat muffins that will keep you full! Make a double batch and freeze them for quick grab-and-go breakfasts that you won't feel guilty about later in the week. Cut the bananas into small pieces and then mash with a fork. Set aside. In a large bowl, whisk together the apple sauce and honey/maple syrup. Add eggs and beat well. Mix in the mashed bananas and milk, followed by the baking soda, vanilla extract, salt and cinnamon. Add the flour and oats to the bowl and mix just until combined. Fold in your chocolate chips or any other add-ins. Preheat oven to 325 F. In a small bowl, mix together all the ingredients for the topping. While the oven is heating, spray each cup of your muffin tin with butter or non-stick cooking spray and use a paper towel to wipe off the excess. Spread the grease between the muffin cups as well, so if the muffins rise too high they don't spill out. Divide the batter evenly between the 12 muffin cups. Sprinkle the topping on the muffins, dividing it evenly. 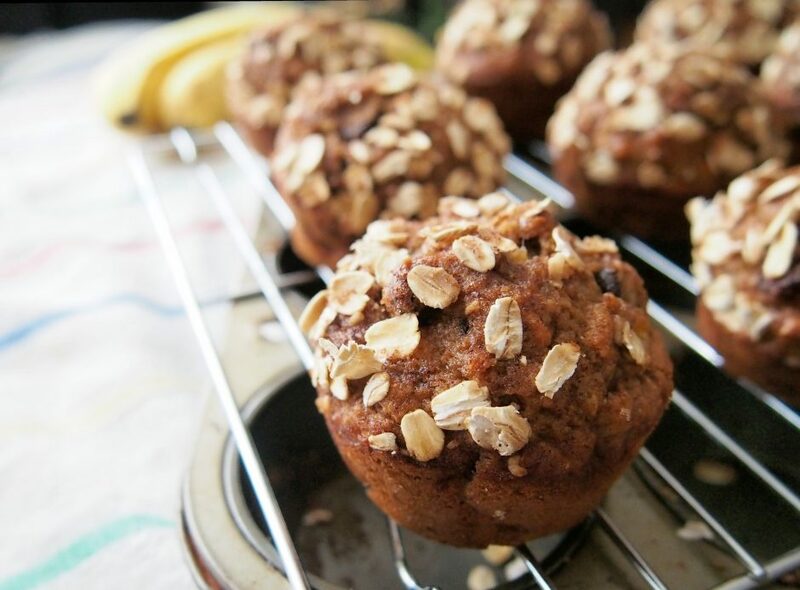 Bake muffins for 23 to 25 minutes, or until a toothpick inserted into a muffin comes out clean. 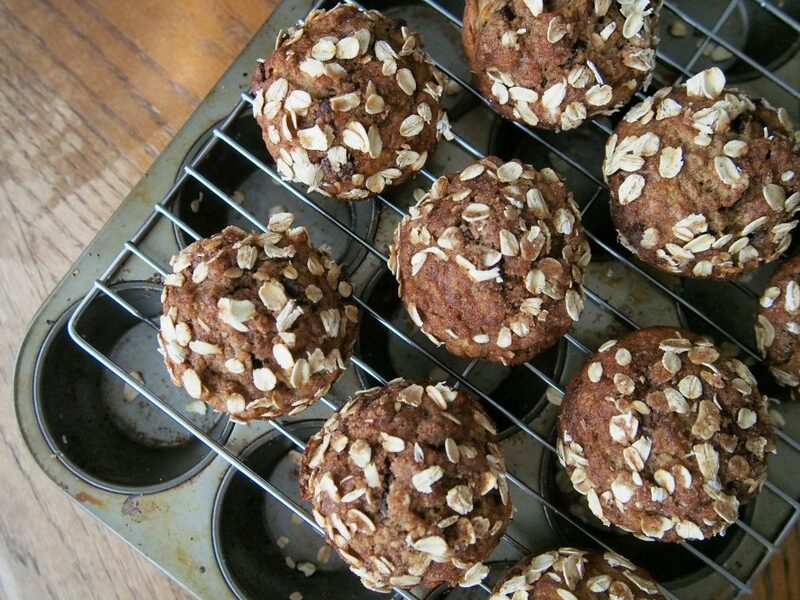 Run a knife or fork around the edges to loosen the muffins from the pan and turn them out onto a wire cooling rack. Enjoy!